One of my cellphone ringtones is "These boots are made for walkin'" by Nancy Sinatra. Nancy's wearin' her boots and she's ready to stomp on some fools. Me too! I don't know what it is, but the sound of my Petries on the barn aisle makes me feel like a pretty freakin' powerful. If my Petries make me a Princess of Power, what do you think the boots to the right, from Smartpak Equine, will bring their wearer? I know the answer: Super powers and super chic. Kudos to Smartpak Equine for branching out into the equestrian fashion zone. This fall's catalog is a blast. The trick to wearing these boots, I think, is to let them make a statement all by themselves. A pair of brown cords, a beige cable sweater, a little thin gold strand around the neck, and you're done. 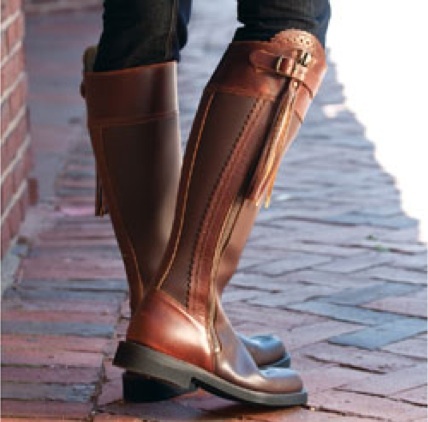 Of course I want a pair, but between Devon and having Riley in full training and flying home for my high school reunion and buying two saddles (used) I have been very, very naughty. I'm on shopping hiatus, big time. I'll be lucky if I'm in any sort of financial shape by Christmas. For some reason I've been getting a wiccan/fantasy/sci-fi/renaissance catalog called Pyramid Collections. For $79, I can have these buccaneer boots. If I don't let anyone get within 20 feet to see that they're vinyl, if I don't actually walk in them for any length of time, and if I don't get them wet or muddy, do you think they might somehow satisfy my yearning for the ubercool boots? No, I didn't think so. Sigh. OK, those swashbuckling boots are totally great. I don't know that I wuld ever wear them, but I love them anyway. They are so much fun. I like the other boots too, but I wonder what you'd do in the winter when you need your wool socks and Toe Warmers in the boot along with your foot! How would all of that fit in there? The trail in Januray is awfully cold for a little svelte pair of boots! Still, do I want them? Yes, because they look so good. You'd need a horse with a patch over one eye and a parrot on his shoulder. Eventer79, yes, for some occasions they would not be right. Funerals. Definitely not funerals. Courtroom proceedings (esp if wearer is a defendant). Also not on boats.